INTRODUCING…FLORENCE WITKOP and WOLF LEGEND! I’m pretty boring. Wife, mother, grandmother. Former teacher, census taker, IT person, former fishing-and-hunting-resort owner and more. I take walks, make handmade greeting cards for my large family and to sell here and there, and I cook large quantities of practically everything and freeze it in small containers that I usually end up tossing when the freezer gets full. What I do that makes the difference… that sets the brand of my writing… is observe. I love watching. I watch everything. People. Trees. Forests. Lakes both above and beneath the surface. Sunlight and shadows. Night and day. Wildlife. Wildflowers. Prairie grasses. Mud. Snow. Ice. Dirt. And everything else. And I incorporate all those things in my writing which is probably why it’s been described as eco-fiction. Because my whole world ends up in there somewhere. I was driving through the forest in a blizzard the thirty miles to my job teaching first grade when I thought there must be a better way to earn a living. Something I could do in the comfort of my own home so I could watch the blizzard instead of drive through it. So, with my husband’s encouragement, I quit my job and started writing and never looked back. 2. What appeals to you about the genre that you write? I don’t write specific genres. Rather I write a story that comes from somewhere inside of me and find a genre that it seems to fit into. Since most of my stories involve a supernatural element because my imagination refuses to be limited by the observed world, that genre is usually fantasy. Re-writing. Taking what I did and making it better, smoother, more easily comprehended. I make greeting cards and have made art gourds and reed baskets, so I’d do something like that. Greeting cards for sure because I can either sell them or give them away. Not so easy to get rid of baskets or gourds. As you might guess, I’m hyper, I can’t sit still, so I’m always doing something. Breakfast. Slow, leisurely and it sets the tempo for the day. But that’s only possible because I work at home on my own schedule. 6. Which are your favorite characters to write, the female characters or the male characters? The heroes and heroines, or the villains? I learned to write in first person, heroine’s point of view and that’s still my favorite. I love how it allows me to dig deep into her character. I’d read constantly if I could. My husband insists I’d never leave the bathroom if the T-paper had writing on it. I love science fiction, love the possibilities inherent in that genre. I’d live in Minnesota in the forest on the north shore overlooking Lake Superior. A hundred odd miles east of where I live now and just like my current home. Cold and snowy in winter, lush in summer, still and wild and beautiful all the time but there’s also that view of Lake Superior, which is awesome. I’m checking out property there but probably won’t end up there because in the process of looking I’ll find something equally inviting somewhere else. I love everywhere. 9. If you were a color, what color would you be and why? Orange because it’s my favorite color. Other than black and white together, that is, I love the simplicity and stark contrast of black and white, only they aren’t really colors so they don’t count. But orange is a color and it goes with anything. It’s a generalist kind of color and I like that. Earth Legend will be the last of the Legends trilogy. It’s planned for sometime late this spring. It’s about a descendant of Ceres, the goddess of the harvest, who stows away on a space ship colonizing a far distant planet because she knows that her expertise with plants will be necessary to keep the plants alive that will keep the colonists alive. She’s caught, of course, and thrown in jail. Jane, who dislikes wolves because they kill livestock, takes Buck Portman, wolf researcher and wildlife professor at the nearby college to an island for a week to seek out the huge wolves legend says have been seen in the area. She’s skeptical until a huge wolf runs through their camp… and mentally connects with Jane. Both woman and wolf are startled by their mental connection. The wolf invites Jane to follow so they can sort out what’s between them. Jane takes off after the wolf in the dark, followed by the confused professor. 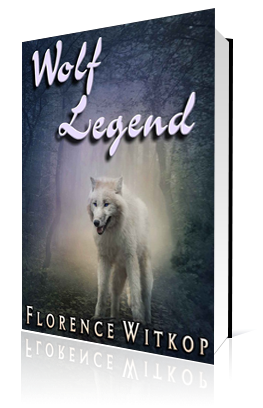 She follows the wolf through a cave and into another world, one populated by larger-than-life, dangerous animals, including the wolves of the legend. Her mental connection to the alpha she-wolf is all that saves their lives in that dangerous place. Days later, when they return to their world, at the request of the alpha wolf they take her wolf pup with a broken leg so it can be healed. Problem is that wild wolves are not allowed as pets in our world so the professor must technically care for the wolf with Jane’s help. But he has reservations. The huge dire wolf pup is in the wrong world. As it grows, will it remain a pet or become a dangerous predator? As the attraction between Jane and the professor grows, so do the problems inherent in having a huge prehistoric wolf in today’s world. I set the cup on the ground beside me to save the one last cold swallow for later when I turned in for the night. Buck, watching, hooked his own empty cup over his belt and prepared to do the same. As my cup touched the ground, the largest wolf I’d ever seen ran through our campsite. Two hundred pounds at least, possibly three hundred, with black velvet, silver-tipped fur and yellow eyes that shone in the night. It was beautiful. Awesome. And it tore through the camp as if we weren’t there, scattering plates and silverware every which way and making short work of the tent just because it happened to be in its path. “Oh my God!” My mouth dropped open because the wolf couldn’t exist. Not here, not anywhere on earth. But it did. The wolf heard. Stopped. Turned towards me. Scared the crap out of me because it was larger than me, double the size of any wolf I’d ever heard of and a predator. Tipped its head to one side and looked straight at me. Stared. Our looks met. Connected. My fear disappeared because it wasn’t looking for food. It was on its way home and in a hurry to get there. The pups missed their mom, the rest of the pack was good, they took care of the pups, but they couldn’t take the place of a real mother. It should hurry home. I blinked. Tried to wrap my mind around what was happening and failed completely. I couldn’t know what it was thinking. I couldn’t be reading its mind. Of course not, it was impossible to know what another human being was thinking, let alone a wolf. Wolves were a whole other species. Except that I did. I was doing precisely what I couldn’t do, what no one could do. I was reading its mind and was pretty sure it was reading mine and was just as surprised at being able to read my mind as I was to know what it was thinking. We stared at each other, adjusting to this new reality. Shock kept us both immobile for what seemed like minutes and was probably seconds. Then the wolf turned away and disappeared into the night because she had a family and responsibilities and couldn’t stay to chat, not even for a conversation as mind-blowing as ours. Two separate species were communicating for the first time ever. But she had things to do and places to go, a pack to care for and pups to feed. So she left. It was an invitation. One I couldn’t turn down. So I rose and followed the wolf. Florence’s stories begin as simple tales of contemporary life, often in small towns or the wilderness she knows so well. Where they go from there is what makes them special. There is always a strong sense of place. Sometimes they cross genres and contain paranormal, sci/fi, or fantasy elements. There is usually a romance and there are always characters her readers like and would enjoy having as friends. Most of all, there is a story because what Florence does best is tell stories. Well plotted stories that carry the characters towards a logical conclusion that always includes a happy ending. Stories that shine light on the human condition while they celebrate the world we live in. Stories that her readers relate to and remember long after the reading is over. She writes about people who are as normal as apple pie (most of them, anyway) who unexpectedly find themselves in the middle of situations ranging from the heartwarming through the difficult and all the way to the horrendous. But Florence’s characters choose to act instead of running away. In the process, they survive, thrive, overcome whatever obstacles large or small are thrown in front of them, and while they are at it, they find time to fall in love. Florence was born in the city and has lived in the suburbs, small towns, the country and the wilderness area of northern Minnesota, where she still lives with her husband and a cowardly cat named Smoke. At various times in her writing career she’s been a confession writer, a copywriter, a ghost writer and an editor. She writes short stories, novellas and novels. Her work has been categorized as romance, science-fiction, fantasy, mainstream and eco-fiction, to name a few genres that it fits so beautifully into. Thanks for having FLorence today! Hi, Rhomy. It’s wonderful to highlight her new book! Sounds like a fun read! Thanks for having me as a guest today. I loved answering your questions. They made me think about how I got where I am and who and what I am today. I hope each and every reader does the same some time, it’s an awesome experience. And I hope they all learn to love Snowball, the white, prehistoric wolf pup as much as I did when writing Wolf Legend. It’s always fun to discover how a writer gets started down that road of publication. We all have similar stories but no two are the same. Which is why we all have such different stories to tell. Thanks for sharing your story with us, Florence!